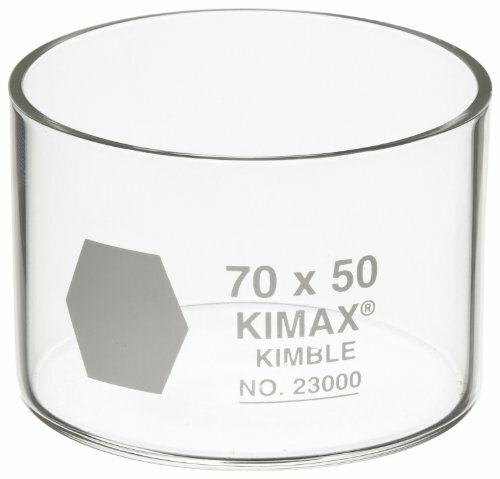 Kimble 23000-7050 Glass Crystallizing Dish, 70mm Diameter x 50mm Height (Pack of 6) by Kimble at Dupen Labs. MPN: 23000-7050. Hurry! Limited time offer. Offer valid only while supplies last. These flat 70mm Kimax dishes have approximately a 160mL capacity with rims that are reinforced and fire polished to reduce chipping. Diameter: 70mm. These flat 70mm Kimax dishes have approximately a 160mL capacity with rims that are reinforced and fire polished to reduce chipping. Diameter: 70mm. Height: 50mm. Kimble #: 23000-7050.